Early summer offers us a tempting taste of what’s to come in the fruit garden. Apples and other trees are already full of young fruits, which will grow on to give a delicious crop towards the end of the growing season. But if we’re to get the most from this bounty we’ll in fact need to remove some of the fruits now. It sounds counterintuitive, but there’s logic behind this apparent madness I promise! Read on or watch our video to find out why we do it. Selectively removing young fruits is called thinning. 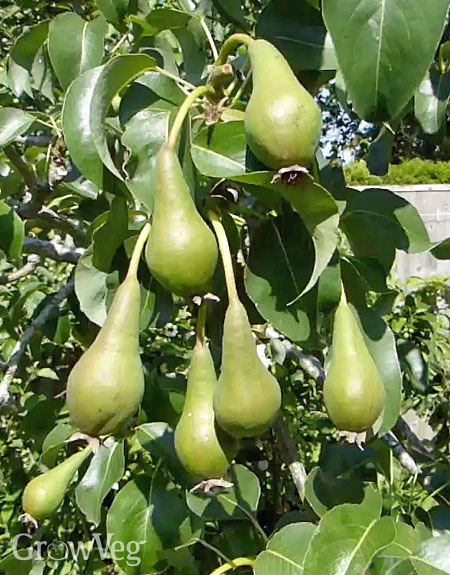 Many tree fruits, including apples and pears, naturally thin their fruits in early summer during the so-called June drop. But thinning further can help trees to stay in good shape and produce a more useful crop. Additional thinning of tree fruits ensures there’s less chance of fruits rubbing together, which can lead to diseases like rot. It also stops trees from cropping heavily one year, only to produce very few fruits the next – a phenomenon known as biennial bearing. Some fruits, particularly plums, can become exceptionally heavy if they aren’t thinned, leading branches to strain then snap under the weight. The main benefit of thinning to the gardener is to give those fruits that remain the space they need to grow into bigger, healthier fruits. The fruits left to grow on will enjoy more airflow, sunlight and energy from the tree for even ripening. Fewer, bigger fruits are generally more useful than many tiny fruits. So let’s show you how to go about thinning an apple tree. I’m using a sharp pair of pruners for the job, but if the fruits are really close to each other you may find it easier to use scissors to get in between them. Apples generally produce clusters of between two to six fruits. We need to thin them to just one or two fruits per cluster. Start by cutting away any misshapen, damaged or scarred fruits. This usually includes the odd-shaped ‘king’ fruit at the center of the cluster. Now remove the smallest fruits and any that are awkwardly positioned. Finally, continue thinning until the fruits are evenly spaced, leaving only the biggest and healthiest. Aim to leave about 4-6 inches (10-15cm) between individual apples of eating varieties. For larger cooking apples you’re looking for around 6-9 inches (15-23cm) between fruits. Pears need less thinning than apples but will still benefit from having young fruits thinned out to give consistent harvests. Thin fruits clusters to two fruits, so there’s around 4-6 inches (10-15cm) between fruits. Plums are notorious for over-producing – with often-disastrous results. Their smaller fruitlets may be thinned using just your thumb and finger to detach the surplus. Aim to leave one fruit every couple of inches (5-8cm), or if it’s easier, one pair of plums every six inches (15cm). Thin peaches in stages: to one fruit every four inches (10cm) once they reach the size of a hazelnut, then again at golf ball size to their final spacing of 8-10 inches (20-25cm). Nectarines should be thinned once to six inches (15cm) apart. "Congratulations on another helpful, short video. I have been pruning my apple trees for many years and notice that when I neglect to prune the fruitlets often small maggots find their way in between two fruitless and into the apple, protected from birds and other predators. Furthermore, if you have particularly ripe looking apples early in the season they often have a maggot in them, detected by the brown frass emanating from the bottom (Calyx) of the apple. I prune these fruitlets first." "Hi Alan. I've never heard of that, so it's fascinating to learn of your experience. It offers yet another reason to thin out your fruits."